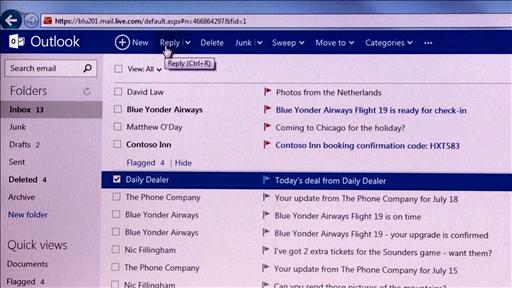 Some customers are having trouble accessing Microsoft’s Web-based email system. Hotmail, the Web-based email service Microsoft acquired in 1997 for $500 million — its largest acquisition at the time — is no more. Microsoft said Thursday that it has finished its Hotmail to Outlook.com transition, a massive undertaking that required migrating hundreds of millions of Hotmail accounts and some 150 petabytes of email data to Outlook.com, its much-improved “modern” email service. With that hard work finished, the number of active Outlook.com accounts has surpassed 400 million, and Hotmail — one of the very first services to offer free Web-based email — is gone, though user Hotmail addresses live on, if their owners so choose. Users of the Hotmail replacement say they have been encountering error messages since earlier this evening. Alison Atkins’ family wanted access to her digital remains. Microsoft is giving its 16-year-old Web-email service a total overhaul and a new name. The results are impressive. After several updates failed to give Hotmail a new image, Microsoft is introducing a new Web-based mail service bearing the name of its flagship desktop email program. A new app that sifts through old photos. Yes, you really wore that.